Computers To Go was founded in 1986 by Scott Petrak. The store was opened to facilitate the needs of several computer consulting firms. Custom built computers and computer repairs were the staples of Computers To Go. 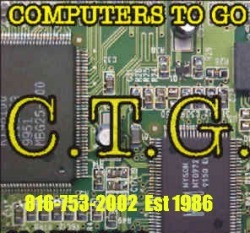 Throughout the years Computers To Go has consistently supplied the highest quality support and service to it's customers which has made the store a local icon in the community. Fast, friendly and personal support along with dedication to detail keeps customers returning back to Computers To Go. Those customers who have bought their first computer from Computers To Go, still return for continual advice, service, upgrades and a little conversation. Computers To Go strives to fill the needs of customers that other stores can't offer. Our long history of computers sales and repair gives us an edge that newer stores don't have. If you are looking for a trusted repair shop or are just shopping for a excellent value in computers/parts, then Computers To Go is for you.